"This is just a plain recipe that I made up when I was bored and everyone loves it. Check it often after 50 minutes to prevent burning." Place apples in a 9x13 inch baking dish. In a bowl, cream together butter and sugar. Stir in flour, instant oatmeal and salt. Fold in walnuts. Sprinkle oatmeal mixture evenly over apples. Drizzle with maple syrup. Bake in preheated oven 50 to 70 minutes, until apples are tender and topping is golden. Really good...I had no idea how much 3-1/2 lbs. apples meant in cups, so I used 5 very large apples,which worked out fine. The addition of maple syrup to the crispy crust is a great idea. This recipe was so good, I used peaches the second time. It didn't even last long enough to get cold. My family wants it all of the time. 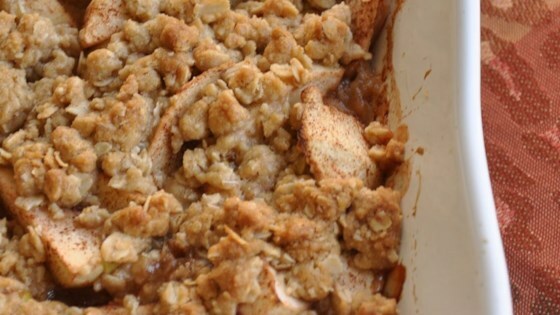 I made this recipe for Thanksgiving and it was the most delicious apple crisp recipe we ever tasted. I substituted apples and cinnamon instant oatmeal instead of maple and brown sugar. This is a great recipe. However, I did add cinnamon and used pecans instead of walnuts. This was a great recipe. Even my husband who normally won't eat desserts ate this. I sprinkled a cinnamon & nutmeg mixture over the top. A wonderful fall treat.